Produce donated to Hope Harbor on August 9. Lincoln, Neb. — A new project is providing and promoting nutritionally dense fresh fruits and vegetables to emergency food access sites across Nebraska. The Cultivating Health Our Way (CHOW) project was piloted in Grand Island during the 2017 growing season. 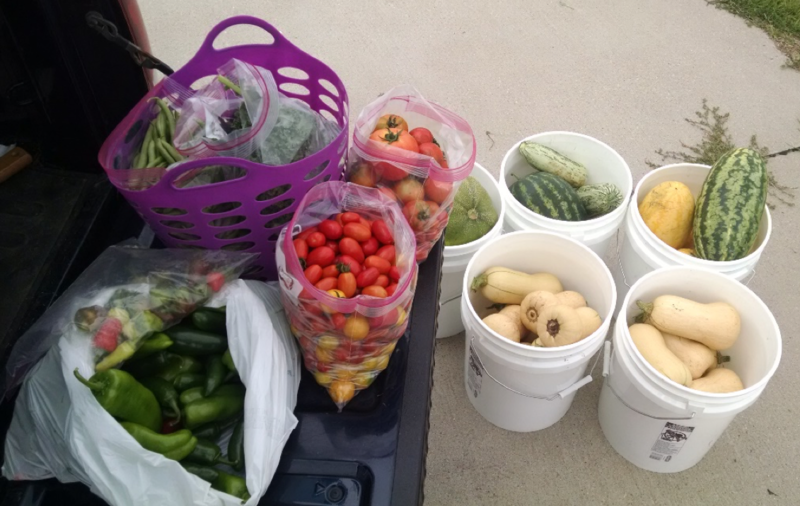 Over 2,450 pounds of produce worth an estimated $3,000 was donated from the Grand Island garden this year. The Supplemental Nutrition Assistance Program-Education (SNAP-Ed), Extension Master Gardeners, Heartland Lutheran High School, Hope Harbor, Third City Community Clinic, Hy-Vee Dietitian Services and community volunteers have collaborated on this project for the growing season. The roughly 100’ by 75’ garden is located at Heartland Lutheran High School where a variety of fruits and vegetables are grown, including tomatoes, peppers, okra, eggplant, cabbage, kohlrabi, beets, kale, three types of melon, spaghetti squash, butternut squash, zucchini and green beans. Raising Nebraska, through Backyard Farmer at the University of Nebraska–Lincoln, donated all of the plants grown in the garden. The amount of produce donated has astounded those working on the project. “Harvesting has been my favorite part of this project because you see the fruits of your labor, and when you are told that it put a smile on a little girl’s face to take a watermelon home, it just makes your heart happy and really shows just why this project is so important,” said Ashlynn Maier, a Nebraska Extension SNAP-Ed assistant and Grand Island CHOW project coordinator. Starting in July, donated produce was distributed in food boxes by Hope Harbor. Families receive a variety of fruits and vegetables, as well as information about the Nutrition Education Program and the CHOW garden. Produce was also handed out at Third City Community Clinic during the month of September. The staff was overjoyed with the amount of produce and the ability to supplement the produce from their community garden to help those in need. Five counties within Nebraska are growing gardens and encouraging community vitality. Each site was given $5,000 to plant, grow, harvest and transport the produce to donation sites. Grant money was also used to connect those receiving produce to those growing it by teaching participants how to prepare produce or providing information about other food assistance programs.